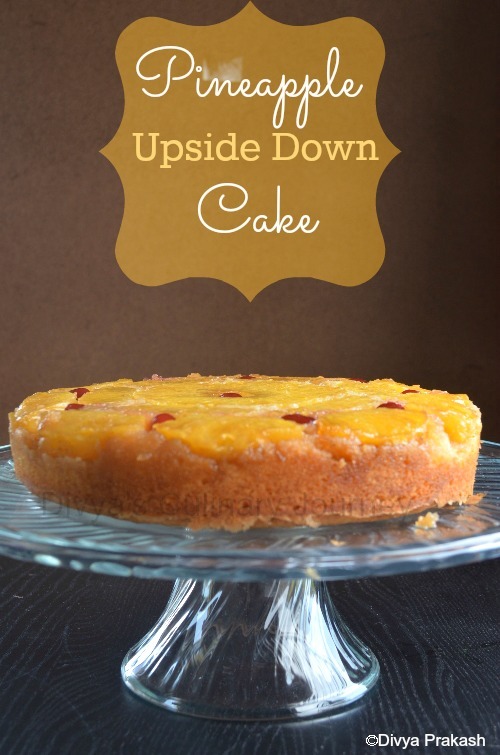 Today's recipe is Pineapple Upside Down Cake. It has been a while since I baked a cake and I had a pineapple sitting at home. 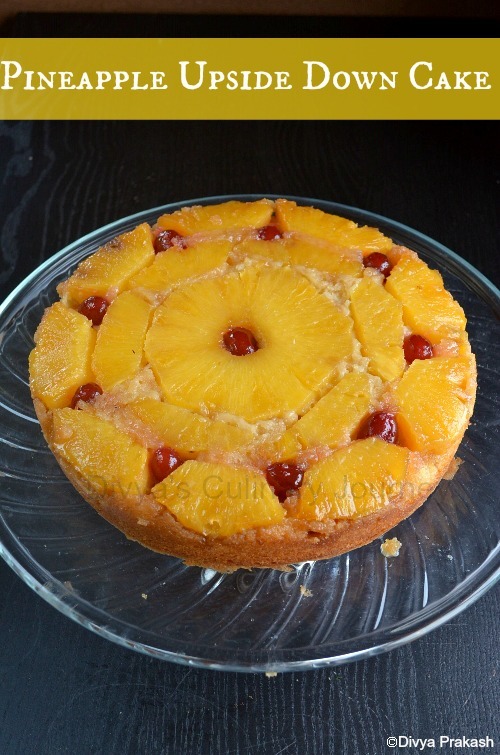 So tried this Pineapple upside down cake and it came out really wonderful. My kids loved it and it was over so soon. I am looking forward to bake it again. Prepare the 9 inch cake pan by greasing and flouring it. Break open the eggs, separate the egg whites and yolks and set them aside. In a saucepan, add butter and sugar and stir in a medium heat till the butter is melted and the sugar is dissolved. Then continue to cook without stirring until the bubble starts to appear around the edges. Now turn off the heat and pour it into the prepared pan. Next arrange the sliced pineapples on top of the mixture. You can also arrange cherries, if you want. In a bowl combine flour, baking powder and salt and set aside. In another bowl beat butter and sugar till they are fluffy. Scrape the sides of the bowl and add vanilla extract and mix well. Continue to beat adding one egg yolks at a time. To this add 1/2 of flour mixture and 1/2 of milk mix well. Then add the rest of the flour and milk and mix well. 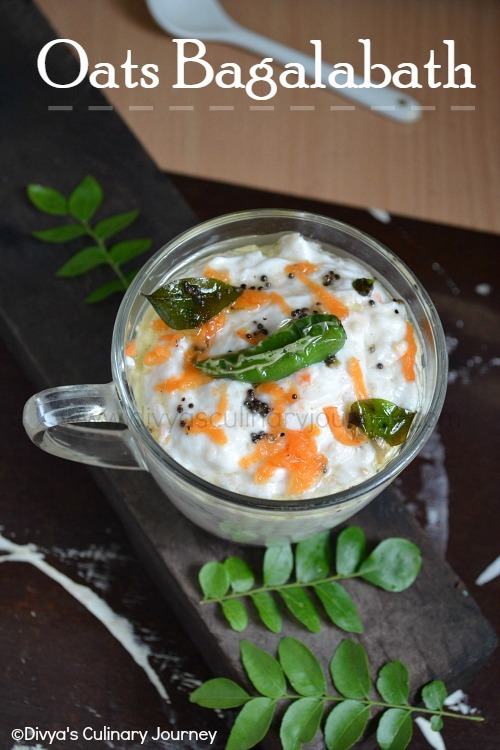 Take a clean bowl whisk the egg whites with cream of tartar until it forms a stiff peak. With a spatula fold the egg whites gently with this mixture. Let it cool for 10 minutes. Then run a knife around the edges and turn it upside down on a serving plate. You can also use canned pineapples instead of Fresh Pineapples. wow...Love to have a piece of slice...Awesome tempting clicks... Bookmarked !! Wow Divya, I love upside down pineapple cake. Yours looks so delicious and mouthwatering. so perfect and lovely clicks. Beautiful and delicious pineapple cake!loved the topping. Awesome. My favorite cake,whenever i bake this cake everybody in my family loved it. 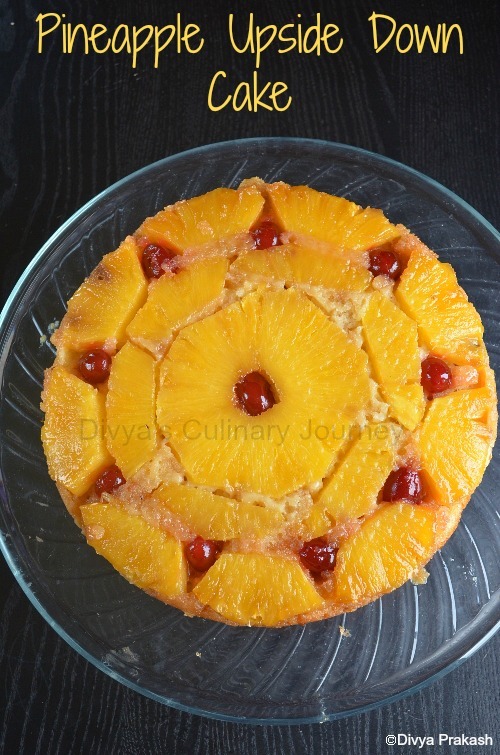 i was planning to do apple cake :) pass me a slice divya..
Pine apple in any dessert is so yummy.love the clicks. 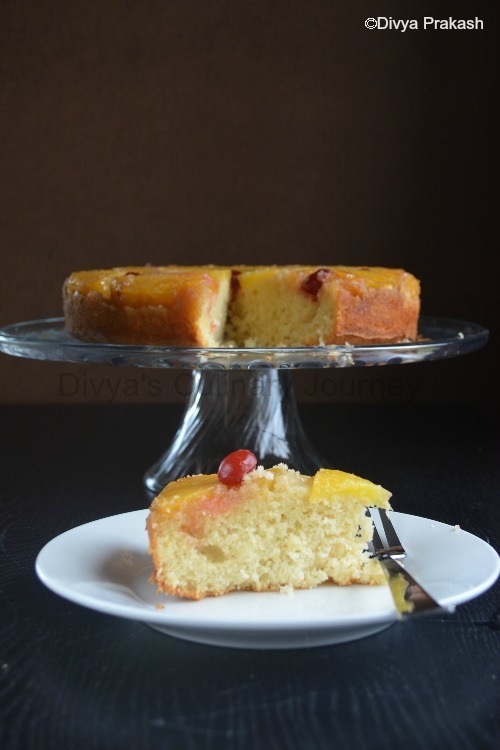 Delicious pineapple upside down cake Divya, beautiful. Cake looks moist and delicious! I wanted to try this cake soon! wow cake looks so soft and moist. Its really very attractive with all that perfectly done pineapple slices. I'm convinced now. I really need to make an upside down cake !